For now it is just testing, but we got to start somewhere. There has been too many misunderstandings as to the different desert tours we are offering. 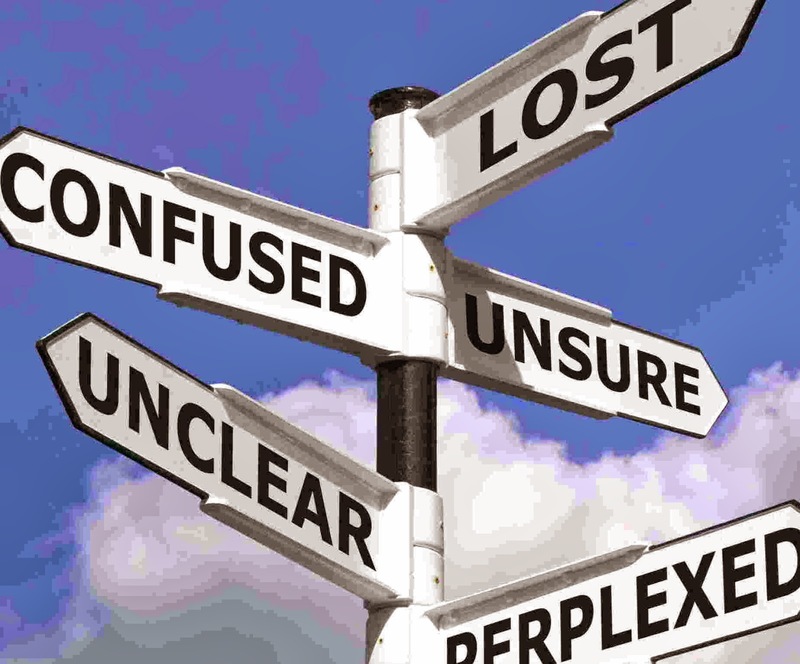 So we are officially renaming one of our tours in order to try to make things a little clearer. The classic Charly’s desert tours which has always been called “Namib Desert Tour”, will from now on be known as “Welwitschia Tour”. The new name better represents the essence of the tour and hopefully assists travelers and booking offices to book the correct tour. We have ordered new brochures with the new name, however the old one’s will be in circulation for a long time. So as a short reminder, the “Welwitschia Tour” explores the Moonlandscape, the ancient canyons carved into the Namib Desert by the ephemeral Swakop River. On this tour we focus on the desert flora, including the famous Welwitschia plants, the Nara and the lichens. Our guides will also introduce the basic geology and guests will see beautiful rock formations. Although we occasionally come across some small creatures, the “Welwitschia Tour” does not enter the dunes, and we do not search for the “little 5” on this tour. This 4 hour tour departs daily at 8h30 and at 14h00 with a minimum of 2 guests. 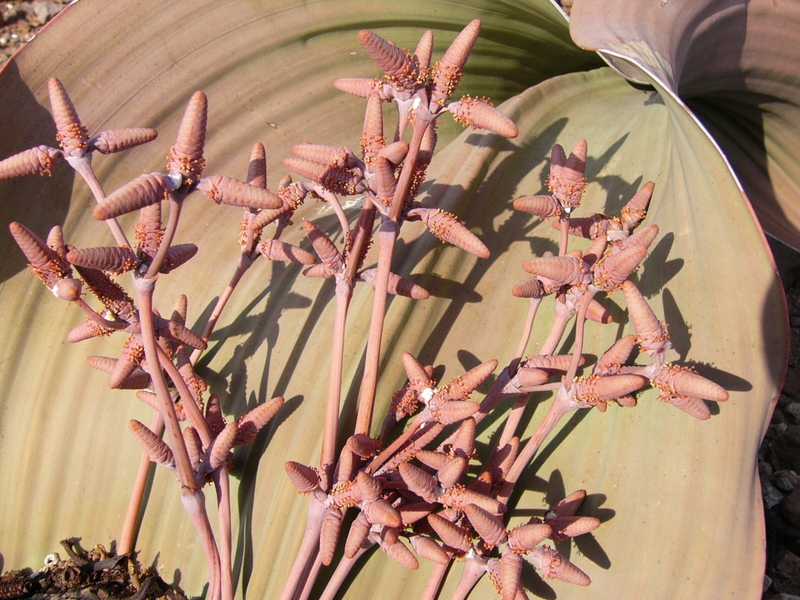 We also offer a full day “Welwitschia Tour”, starting at 8h30 and returns at about 16h30. A light lunch is included. 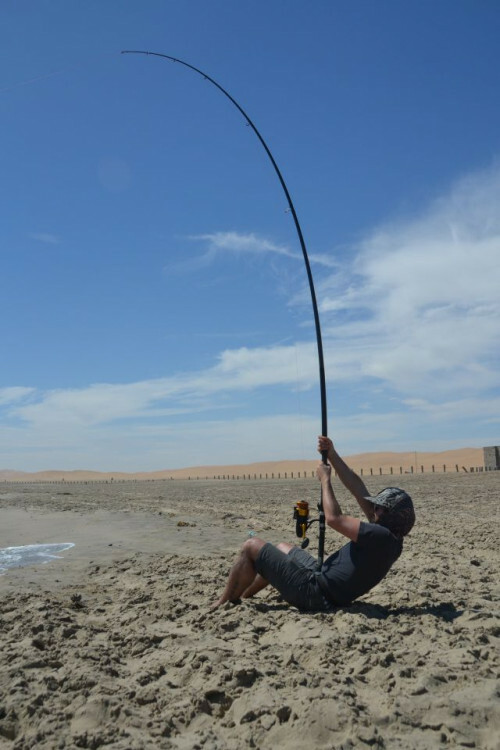 Probably the most underrated activity in Swakopmund must be the Intertidal Beach Tour offered by well-known fishing company Aquanaut Tours. These guys have been on our beaches and observing the live in the rock pools for many years. The intertidal beach tour is possible only low tide, so this activity will not be available every day and naturally not always at the same time. Where we and others typically brag about the “little 5” tours in the dunes, the intertidal beach tour should have been called the “little 50” tour. 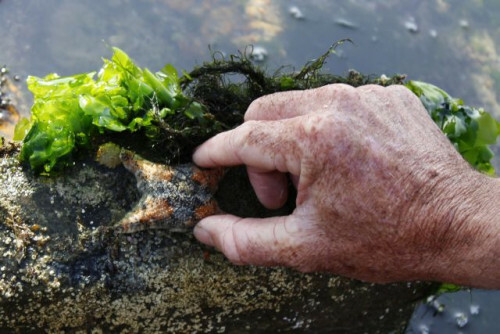 The amount of life on our virtually pristine coastline is just amazing, but even more impressive is the skill of finding and identifying all these amazing little sea creatures. Sea cucumbers, crabs, variety of star fish, sea hare, mollusks, mussels, fish, anemones and so much more. This is the perfect outing for families, the kids will be as fascinated as the adults. Make your reservation for December now. Since the departure time of this booking is tide dependent, the correct time of the tour will be communicated to you once we have your booking. Online bookings and live availability checks are the way of to go. More and more Swakopmund based companies are making use of modern online reservations systems, and our fishing partner, Aquanaut Tours is one of them. Book your fishing trip online now, to make sure you don't miss out when the local holiday season starts. It is all pretty easy via our website, where full and half day fishing trips and many other activities are available. 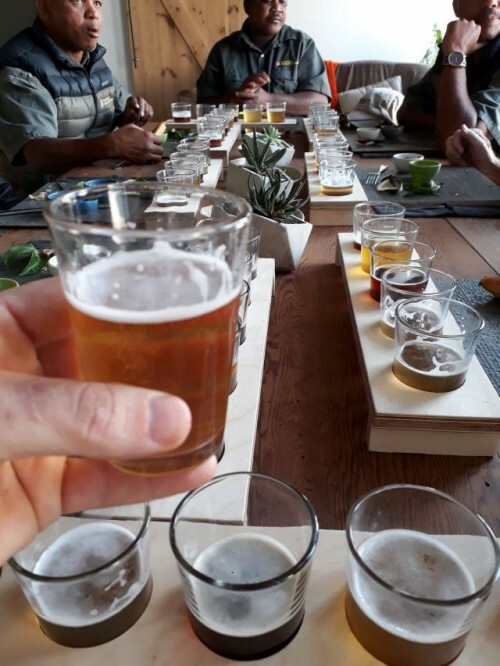 The Bites & Brews tour was the highlight of our limited time in Swakopmund. We were introduced to locations and products that were off-the-beaten-path and would have escaped our notice otherwise. Every site we visited had a unique offering. It was a perfect combination of relaxed exploration and information. As a lover of olives, essential oils, coffee, beer, fine dining, and gin, this was pretty much a perfect excursion for me. The passion of the guides and the hosts at each location was evident and infectious. We actually came back to Two Beards coffee shop and bistro for more deliciousness the following day on our own, now that we knew where the place was, thanks to Gerald and Nick. 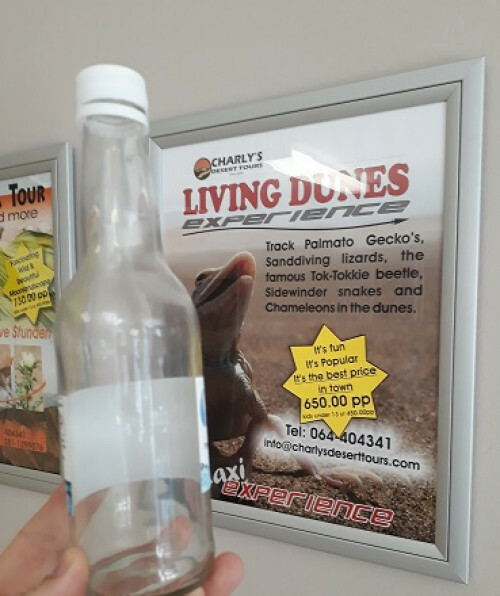 We went out with Charly's again 2 days later for the Living Dunes, which was also fantastic. I wish I could go higher than 5 stars on this one. Yesterday was the beginning of our cruise ship season. The "Europa 2" was built in 2013 in France and can accommodate 516 passengers. 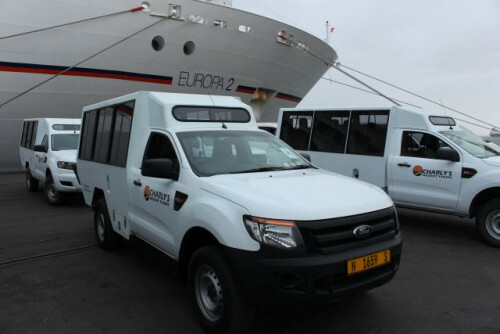 We were contracted for a full day desert tour for 48 guests, departing from the Harbour of Walvis Bay. 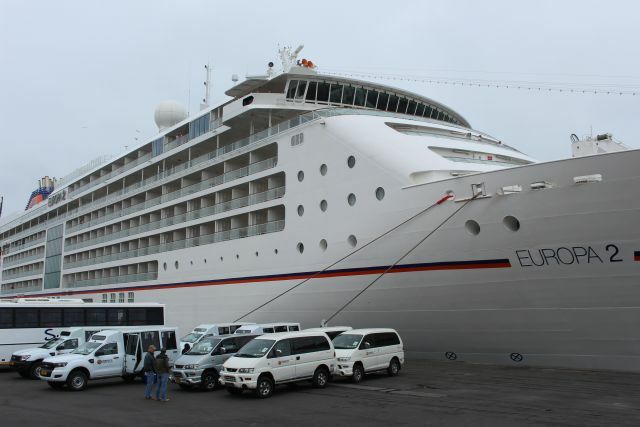 The sister ship "MS Europa" with a capacity of 408 passengers will call in early December, and we will be there again. Today 5 years ago I took over Charly’s Desert Tours. What a strange experience it was to answer my first phone call with “Charly’s Desert Tours, how can we help?, still sitting in my little home office somewhere in Vineta and feeling a little lost. The business was about to be closed under the previous owner and there were only one or two confirmed day tours on the calendar. Since I did not buy the old and familiar Land Rovers, I started with 2 second hand Mitsubishi Delica’s that I brought into the business from my previous work. A lot has changed since… I am no longer sitting alone in my home office, but we are a small team in a downtown office in a central location with lots of walk in clients and a great number of tour operators and hotels / guesthouses who are booking the various tours we are offering. Today we are receiving the license to our 4th custom build and brand new 10 seater vehicle and our fleet has grown to currently 9 vehicles. Some of the old tours, like the Cape Cross and Messum Crater Combo, were discontinued, and we have eventually stopped offering tours, so we can concentrate entirely on the day tours we operate and the activities we sell from our registered booking office. We have also retired the old bookings diary and moved to an online booking and management system. 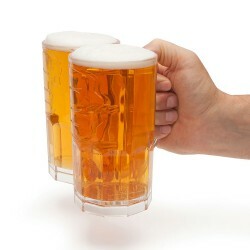 Our new tour “Bites & Brews” has been introduced and we are busy getting the word out into the world and working on future bookings. We are confident that it will be a hit, but we know new things take time. For the period of 1 year until today, we have had about 14 000 customers, and have received TripAdvisor certificates of Excellence for the last three years running. Reaching this point is due to lots of hard work, long hours and weekends, but would not have been possible with the team in the office, including my wife Rene who took over all the admin and the dedicated team of guides that stuck with me. Jonny, Ernst, Kooitjie, Nick, Bawden, Harald and Egon (who have since retired), Jochen, Cleo that eventually moved on, Ruth and lately Klaus, occasionally Frank, and a few drivers that have taken care of so many airport and desert dinner transfers. 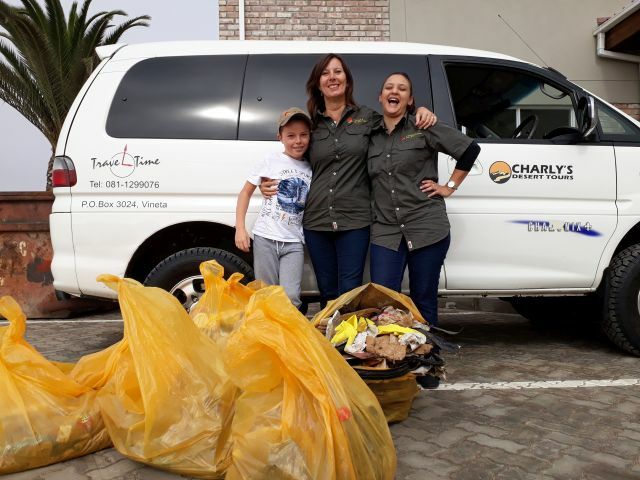 So here is a big THANK YOU to all that have supported Charly’s Desert Tours in the last 5 years! As part of guide training for our new day tour, here we are busy with many glasses of fine craft beer. What a fun afternoon this turned out to be. The guides are excited to start this new venture and we are sure our guests will have a lot of fun and will be amazed by the quality of products they will be introduced to on this tour. Online bookings for the BITES & BREWS are now open on our website. Our new tour is here! Celebrating locally grown and crafted products. In conjunction with local farms and craftsmen we introduce world class products made here in Swakopmund by passionate people. 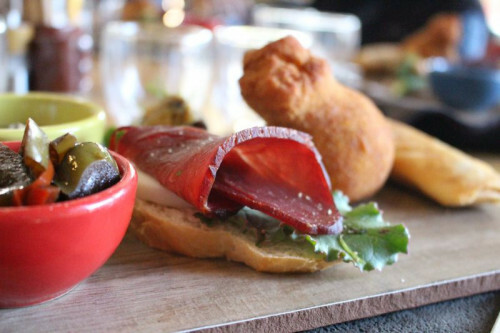 Local products are trendy, more sustainable, creative and fun. At nearby farms we delve into the secrets of the ancient Jojoba oil, the endemic !Nara oil and visit an olive grove. We explore a coffee roastery, do tastings of Swakopmund craft beer and gin while snacking on some delicious local snacks. Small groups of up to 10 guests ensure an intimate and fun experience. Finally there is something to do in the afternoons, no matter if the South-west wind blows or not. 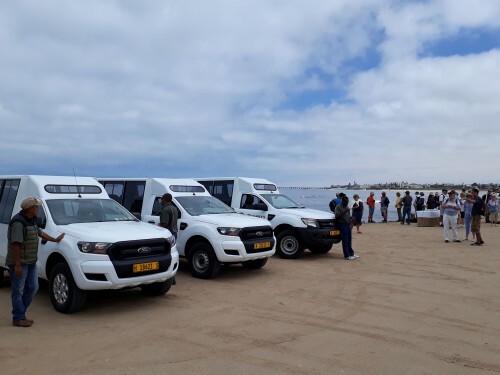 This tour will be departing Swakopmund with a minimum of 2 guests at 14h00. Until we can tell you more, have a cold beer, the sun is shining in Swakopmund. For decades the Swakopmund day tour / activity market has been dominated by a handful of choices. Some are water based like the Seal & Dolphin Cruises or Kayaking, some are based on the dunes like the Sandwich Harbour Tours and the Living Desert Tours, some explore the hinterland like the Welwitschia plains and the Kuiseb River with the Topnaar community. Some even go to Cape Cross, some fly over the desert and some stay in town like City Tours or Township Tours. All of these come in different shapes and sizes. Different timings, durations, prices, bigger groups, smaller groups, older vehicles, newer vehicles.... Most if these activities are great and totally worthwhile experiences, offered by passionate operators and guides. But it is time for something new! Something different! Sometime in mid-September hopefully, Charly's Desert Tours will start a fresh new half day tour called........................................... (Ha, we will not give it away yet). All I can say at this moment, our new tour will depart in the afternoon at 14h00. Oh, the afternoon winds we typically experience here at the coast will not bother us. So, when you are back from your Kayaking trips and Dolphin cruises, your Living Dunes Experiences and your late morning Quadbike trip, you will be in time to join us in small groups of up to 10 guests on the ................(almost gave it away). Oh, something else I can say. The duration will be about 4 hours. We will reveal more information sometime next week...until then, enjoy a good cup of coffee, maybe it can help with the cold weather. Staying at an Airbnb in Swakopmund? With the ever growing phenomena of Airbnb, we as a local day tour / activity supplier are faced with the ever-growing frustration of not finding guests booked on our tours. As the overwhelming majority of Airbnb’s are private home and apartments with no branding, we are having real trouble finding guests booked on our activities. So, Charly’s Desert Tours will no longer pick up guests from Airbnb’s and private homes, but rather meet guests at an agreed upon location, like our offices or a central public parking area. Other guests have to wait for long times, or drive around aimlessly with our guides in search of unmarked houses, often with not even a telephone number. Should you be staying with friends or at an Airbnb, please let us guide you to a mutual meeting place. Our country called for action and we answered. Namibia's first National Clean-up Day was held last Friday. Although it was a busy day for our guides and our office, we entered a small team to do our bit. Even my 9 year old son joined in. The young man was very eager and thinks it was a great idea to clean up the environment. Although it felt good collecting so much garbage, we are saddened by the fact that there was this much garbage in the first place. We will soon have a trial month where we will not issue single use plastic water bottles. I have mixed feelings as to how our clients will respond to this, but let’s at least try. More on this will follow soon. 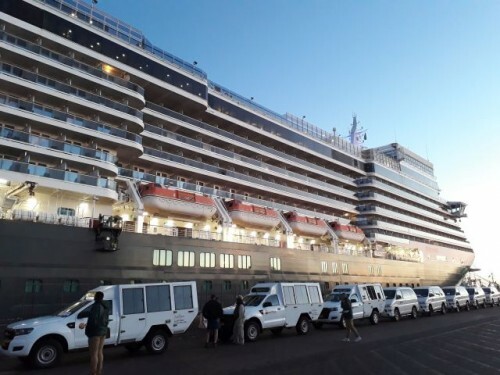 Yesterday the Cruise-liner season for Namibia came to an end on a high note with a call of the Queen Elizabeth. We had an early start and the harbour was still nice and quiet. Some of the guests had the opportunity to go "Safari for the little animals" as one of our guests called our Living Dunes Experience yesterday. Our fleet of 4x4 vehicles looks so small next to this majestic ship. We would have to make 38 trips in our fleet if we had to take all of the 2092 guests the ship can accommodate on tour. If we were to do two tours a day, this would keep us busy for 19 days. Unfortunately these cruise-liners arrive in the morning and set sail again the same day. Typically I don't share recipes, but I have to share this today. Last night I learned something while celebrating a friend’s birthday at the Old Steamer Restaurant here in Swakopmund. 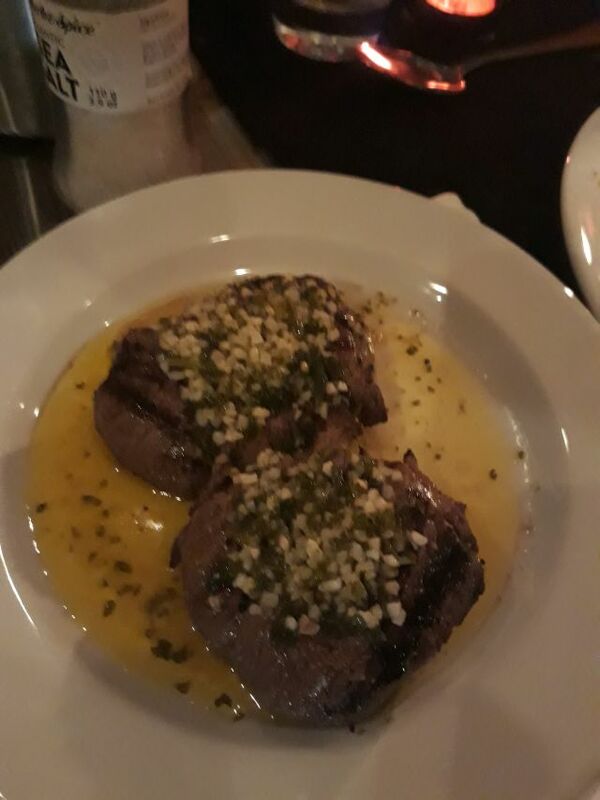 The best accompaniment to a Fillet steak with a pepper sauce is to enjoy it with another steak with Garlic butter! Who needs salads an all the other fancy stuff if chef Albi serves you his best cut of beef? Find the Old Steamer at the Alte Brücke Resort in Swakopmund. The service is great, the décor is nice, the food is fantastic, and the price is pretty reasonable. Finally our Sand & Rock Combo is just a click away. We have managed to make this combo tour available online, and have even managed to add the delicious Crayfish lunch for those who want to be pampered. Where our full day Namib Desert Tour is available only for a minimum of 4 guests, we offer the Sand & Rock tour with a minimum of 2 guests, as we are essentially combining the popular Living Dunes Experience and the half day Namib Desert Tour. This combination shows the desert from all sides, what a wat to spend the day! We had the pleasure of welcoming a number of guests from the Queen Mary 2, one of the world’s largest cruise liners. With tours in the morning and in the afternoon, we treated a number of guests to see and experience the beauty of the Namib Desert. 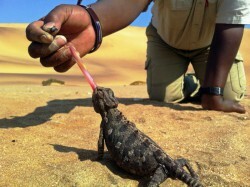 Our 3 hour tour in the dunes introduced the guests to the wealth of life in the desert. Plenty of exceptional photo opportunities and a glass of bubbly on the beach made for a fun and educational eco tour in our custom built Safari vehicles. Charly's Desert Tours will be closed for 25 and 26 December 2017 and operate normally during the rest of the holidays. Just 1 January we will be closed for New Years Day. We wish all a Merry Chistmas and safe traveles wherever you are! Just beyond the coastal fog line, Gecko Ridge rarely suffers the damp misty mornings often experienced in Swakopmund and Walvis Bay, and instead mostly enjoys radiant blue skies and beautiful sun all day long, making it eminently suitable for those who just want to get away from it all, or wish to arrange a private function or a year-end celebration. In this quiet location, an outdoor Lapa and a number of bedrooms overlook a large, partially enclosed swimming pool. 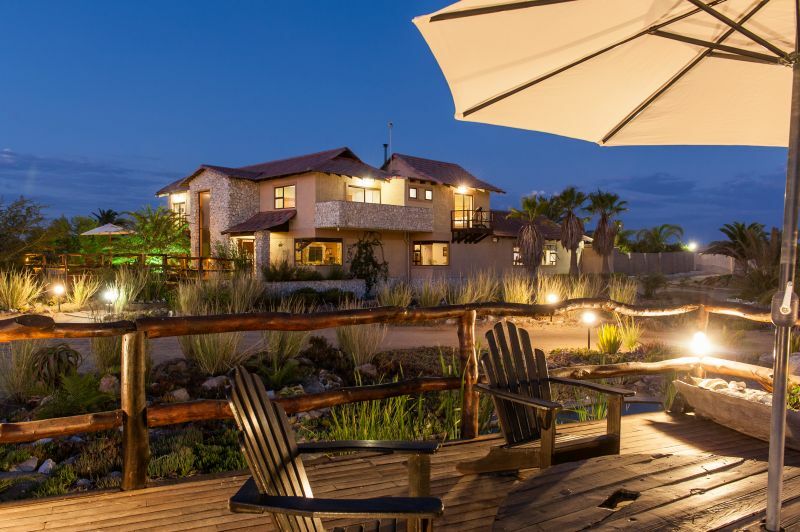 Beautiful wooden sun decks overhanging ponds of running water allow for a well-deserved sundowner to be enjoyed in idyllic surroundings, while taking in the amazing sunset over the Namib Desert and the famous 'moon landscape'. Luxury, comfort, tranquillity, hospitality and attention to detail; these are attributes which ring true at Swakopmund Sands. Treat yourself and make your experience one to remember. The hotel’s location, on the platinum mile, is within walking distance along the beach leading directly into town. And for peace of mind, 24-hour secure parking is available. The Swakopmund Sands presents you with a choice of 25-rooms, ranging from luxury rooms, to single and family rooms. 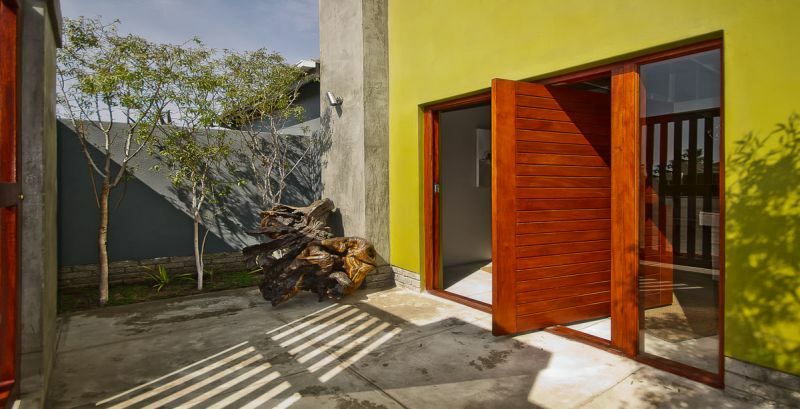 Organic Square Guesthouse provides luxury modern living, with spacious, private rooms each with their own little garden. Beautifully renovated, this guesthouse is located in the heart of historical Swakopmund. After a peaceful night in your comfortable room you’ll be treated to a wonderful healthy organic breakfast before venturing out to discover the unique surrounding landscapes and history of the area. At Organic Square Guesthouse, we provide our guests with modern luxury accommodation and we go out of our way to provide the highest level of customer satisfaction – to ensure a memorable stay in Swakopmund. With a variety of rooms available, we’re sure to find the right living space to accommodate our guests. For more information and bookings follow this link. The Secret Garden Guesthouse in Swakopmund, Namibia’s Premier Holiday & Tourist Destination on the famous ’Skeleton Coast’ offers you all the comforts of your own home at reasonable prices. All our 6 double en-suite bedrooms and 3 ’Comfort’ double en-suite bedrooms face onto a secluded courtyard. There are also 2 Luxury suites with private balcony. Breakfast is included. Part of the Secret Garden is our Bistro where you can enjoy ”Meal of the Day” and delicious Pizzas. For more information and bookings please follow this link.